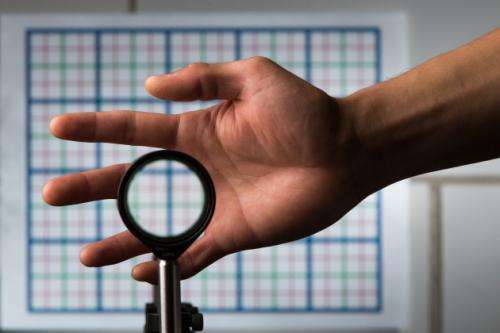 Inspired perhaps by Harry Potter's invisibility cloak, scientists have recently developed several ways—some simple and some involving new technologies—to hide objects from view. The latest effort, developed at the University of Rochester, not only overcomes some of the limitations of previous devices, but it uses inexpensive, readily available materials in a novel configuration. "There've been many high tech approaches to cloaking and the basic idea behind these is to take light and have it pass around something as if it isn't there, often using high-tech or exotic materials," said John Howell, a professor of physics at the University of Rochester. Forgoing the specialized components, Howell and graduate student Joseph Choi developed a combination of four standard lenses that keeps the object hidden as the viewer moves up to several degrees away from the optimal viewing position. "This is the first device that we know of that can do three-dimensional, continuously multidirectional cloaking, which works for transmitting rays in the visible spectrum," said Choi, a PhD student at Rochester's Institute of Optics. The Rochester Cloak can be scaled up as large as the size of the lenses, allowing fairly large objects to be cloaked. And, unlike some other devices, it's broadband so it works for the whole visible spectrum of light, rather than only for specific frequencies. Their simple configuration improves on other cloaking devices, but it's not perfect. "This cloak bends light and sends it through the center of the device, so the on-axis region cannot be blocked or cloaked," said Choi. This means that the cloaked region is shaped like a doughnut. He added that they have slightly more complicated designs that solve the problem. Also, the cloak has edge effects, but these can be reduced when sufficiently large lenses are used. While their device is not quite like Harry Potter's invisibility cloak, Howell had some thoughts about potential applications, including using cloaking to effectively let a surgeon "look through his hands to what he is actually operating on," he said. The same principles could be applied to a truck to allow drivers to see through blind spots on their vehicles. Calling this setup a Cloaking Device is downright childish. Sometimes I wish the whole concept didn't exist in fairy tales and fiction. Then we could see scientists do real work instead.